For over 60 years, the Metropolitan Vacuum Cleaner Co., Inc. (Metrovac) has been creating and manufacturing its line of vacuum cleaners that have revolutionized the industry with powerful cleaning abilities combined with practical features like portability and high efficiency. Do you want to take car drying to the next level? Try the Air Force® Master Blaster® Revolution™ with 30 foot hose. 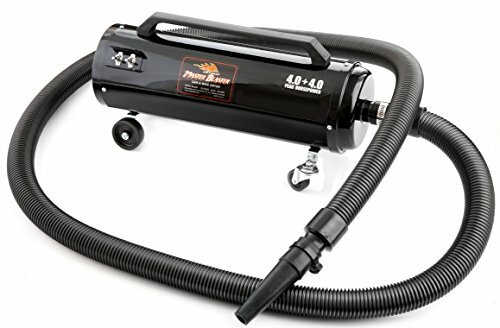 How would you like to be able to hang your Master Blaster® Revolution™ by the overhead door of your garage and just walk around your car with a 30 foot hose? You’ll get the same power of the Master Blaster® Revolution™ with the convenience of a super long and durable hose. It’s one of our best-selling car dryers! Air Force Master Blaster: Features 8 Peak HP (2-4.0 PHP) Twin Fan Motors, 2 Front Swivel Wheels, 30ft. Heavy Duty Hose, 1 1/2” Neoprene Blower Nozzle, 1-1/4” Adapter, Blower Nozzle, Micro Adapter, Air Streamer Tool and Air Flare. This model comes with a 30 foot commercial quality hose! Easily navigate around your car! The Revolution includes a wall mount bracket for your Revolution and a hose hangar for the hose. Conveniently mount on the wall for easy use! The Revolution uses warm, dry filtered air to safely blast water off expensive finishes and out of hard to reach places where no towel or chamois could ever reach. The Master Blaster Revolution is Deliberately Made Better in the USA!